Eden Cat 'Country Cuisine' is a naturally hypo-allergenic, nutritionally complete food formulated with high levels of Taurine with a diversity of meat, fish and eggs, based on the Ancestral diet of Cats. What is Eden holistic dry cat food? Eden Country Cuisine is a naturally hypo-allergenic, nutritionally complete food formulated with a high levels of Taurine with a diversity of meat, fish and eggs, based on the Ancestral diet of Cats. Eden Country Cuisine has been made in Britain with freshly prepared, human grade quality Suffolk Duck, grass-reared Lamb, Rabbit, Venison and whole egg. Health supporting herbs, organic vitamins and minerals for optimum absorption. All Eden products have been formulated without grain, gluten or white potato. 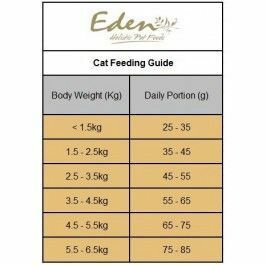 What are the benefits of feeding Eden holistic dry cat food? 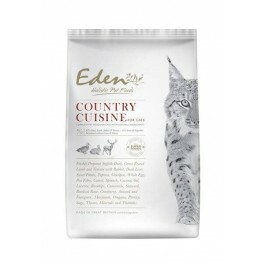 What is in Eden Country Cuisine dry cat food? Composition: Freshly Prepared Duck 42%, Freshly Prepared Lamb 15.5%, Dried Duck 12%, Sweet Potato 8%, Freshly Prepared Venison 8%, Dried Rabbit 2%, Tapioca 2%, Chickpea 2%, Whole Dried Egg 2%, Dried Lamb 2%, Duck Liver 1.5%, Pea Fibre 0.24%, Coconut Oil 0.24% Carrot, Spinach, Lucerne, Rosehips, Burdock Root, Camomile, Seaweed, Cranberry, Aniseed and Fenugreek, Marjoram, Oregano, Parsley, Sage, Thyme, Vitamins and Minerals, Fructooligosaccharides 460mg/kg, Glucosamine 340mg/kg, MSM 340mg/kg, Chondroitin Sulphate 240mg/kg. Analytical Constituents: Crude Protein: 38%, Crude Oil and Fats: 22%, Crude Fibres: 2%, Crude Ash: 11.5%, Moisture: 7%, Omega 6: 3.8%, Omega 3: 0.3%, Calcium: 2.3%, Phosphorus: 1.4%. Nutritional Additives: Vitamin A (as retinyl acetate) 24,000 IU/kg, Vitamin D3 (as cholecalciferol) 1,500 IU/kg, Vitamin E (as alpha tocopherol acetate) 600 IU/kg. Enriched with essential vitamins and oils, Naturally stabilised with mixed-tocopherols. Contains no added synthetic antioxidants. Trace Elements: Ferrous Chelate of Amino Acids Hydrate 440 mg/kg, Zinc Chelate of Amino Acids Hydrate 580 mg/kg, Manganous Chelate of Amino Acids Hydrate 175 mg/kg, Cupric Chelate of Amino Acids Hydrate 44 mg/kg, Potassium Iodide 1mg/kg, Sodium Selenite 0.6mg/kg. Amino Acids: L-Canitine 105mg/kg, DL-Methonine 2000mg/kg, Taurine 1900mg/kg. How much Eden dry food should I feed?